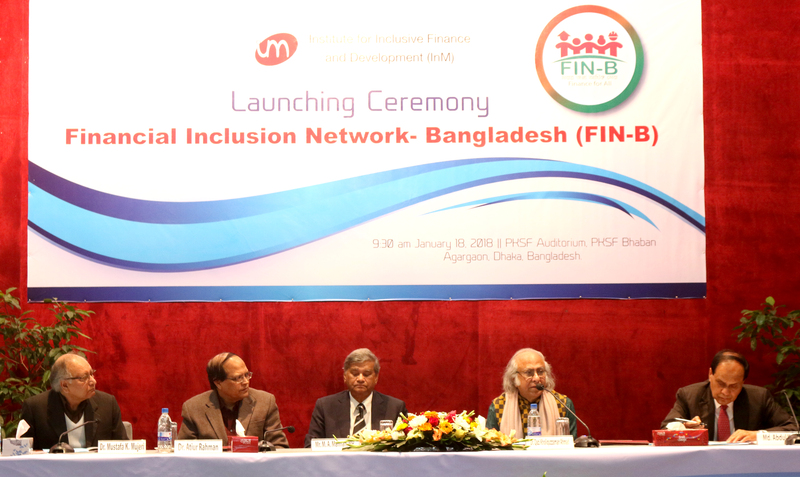 The Launching Ceremony of the Financial Inclusion Network, Bangladesh (FIN-B) was organised by InM on 18 January 2018 at the PKSF Auditorium in Dhaka.Mr. M. A. Mannan MP, State Minister, Ministry of Finance and Ministry of Planning graced the occasion as the Chief Guest. The session was chaired by Dr. Qazi Kholiquzzaman Ahmad, Chairman of InM. Dr. Atiur Rahman, Professor of the Department of Development Studies, Dhaka University and Former Governor, Bangladesh Bank presented the keynote paper. Selected dignitaries, policy makers, academicians, researchers, relevant stakeholders, and development practitionerswere present in the Ceremony.